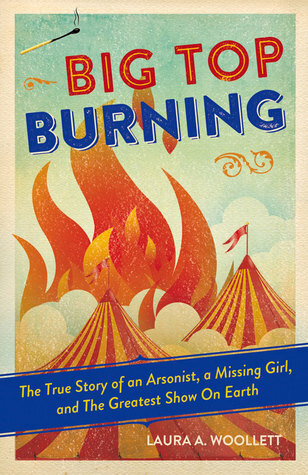 Big Top Burning: The True Story of an Arsonist, a Missing Girl, and The Greatest Show on Earth by Laura A. Woollett. Grades 5 and up. Chicago Review Press, June 2015. 168 pages. Review copy provided by my local library. "The mysteries surrounding the Hartford circus fire are still being explored today, more than 70 years after the disaster occurred. Professionals and amateurs alike have examined the evidence and argued their theories. Now it's your turn." Big Top Burning tells the story of a tragic fire at the circus in Hartford, CT in 1944. Even today, people aren't certain exactly what happened, but this book gives you the facts and lets you make your own conclusions. This is a great read for anyone who likes exciting, true stories from history or adventure series like I Survived. My thoughts: This is a pretty riveting story about a disaster that I literally knew nothing about. Plenty of archival photos help bring the time period to life and the action starts very quickly. Much of the book concentrates on the mysteries that arose after the fire was over and survivors started to piece together the remains of the dead. I think that kids who enjoy disaster stories (like Titanic, I Survived, etc.) will eat this one up. A friend of mine said on GoodReads that this book is "well-suited to the budding true crime reader" and I couldn't agree more. Readalikes: Kids who enjoy reading about true disaster stories might also enjoy the book Fighting Fire! : Ten of the Deadliest Fires in American History and How We Fought Them by Michael L. Cooper. Kids who like reading about disasters might also enjoy the fictional series I Survived by Lauren Tarshis or the Survivors series by Kathleen Duey and Karen Bale. Very cool there's a children's book about this! I absolutely loved The Circus Fire by Stewart O'Nan which I listened to on audio about 5 years ago. Riveting.